If the folks at the Pasadena Humane Society could see him now, running on the beach, fetching Frisbees at the ball park and taking sunset walks through town. It’s a tough job, but some doggy’s got to do it. Snorkeling at the north end of Munjack Cay after a fishing day with Lincoln Jones. A few weeks back, I noticed this group of boys playing on a wooden raft along New Plymouth’s south beach. Though the origins of said raft were dubious – two boys said they made it, two said they found it – their joy was not. They paddled around the shallows near the south beach dock, tying up and untying the raft, tossing out and hauling in its small anchor. Watching them reminded me of the times we spent on Green Turtle Cay during summer vacation, and how much freedom we had. My cousins and I could meander through town at any hour without worry or harm. We had no television or phone, smart or otherwise. There were no video games, no DVD player, no iPod. Instead, we played outside. We used our imaginations. If we wanted to go somewhere, we walked. Both ways. Uphill. In four feet of snow. Yes, ok, I made up that last part. But the rest is true. We hunted baby crabs on the Settlement Creek shore and collected sand dollars at Gillam Bay. We swam near the public dock and fished with tiny hooks and thread, using crushed snails for bait. In the evenings, we walked around New Plymouth, searching for night-blooming jasmine. Nearly four decades later, surprisingly little has changed. It’s true that local residents now enjoy modern conveniences like telephones, cable television and even Internet. But technology aside, and unlike so many other places, Green Turtle Cay has managed to retain much of its innocence and charm. Kids, some as young as five or six, still play unsupervised on the town basketball court or nearby beaches. They make (or find…?) rafts and become pretend pirates. They abandon skateboards, bikes and basketballs wherever they fall, confident they’ll still be there when school lets out tomorrow. I watched them play for quite a while, enjoying the reassurance that, especially for kids, Green Turtle Cay remains as idyllic as I remember. It’s my cousin’s birthday today, so this rose is for her. 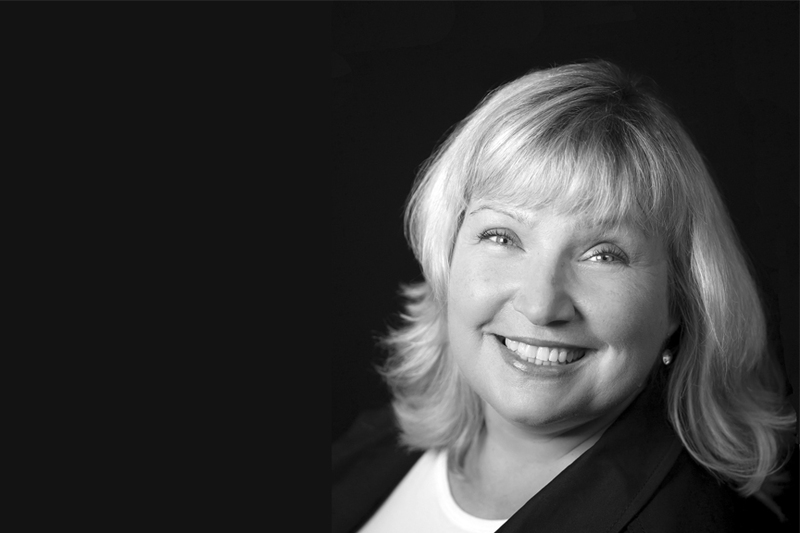 Happy birthday, Dawn! Sunset last night over Settlement Creek, Green Turtle Cay, Bahamas. Summer is definitely here! We’ve been having storms on the cay almost daily. This photo of lightning over Treasure Cay was taken yesterday afternoon from Green Turtle Cay’s South Beach. My husband will probably roll his eyes when he hears this, but I’ve shot more than 15,000 photographs in Green Turtle Cay and around Abaco in the past twelve months alone. What can I say? I subscribe to the “quantity leads to quality” school of thought — the more photos I take, the greater my chances of getting one I’m happy with. To justify what some might regard as an abuse of megapixels, I’ve decided to share some of my favourite images through a daily photo feature. Here’s the first one, a seagull diving for fish in Black Sound. Hope you like it. A guest post, from my husband, Tom Walters. For some on Green Turtle Cay, our little house by the ferry will always be thought of as “Miss May’s.” And their memories of Amanda’s great-grandmother, May Curry, have a recurring theme. At a time when many people cobbled together a livelihood in a variety of entrepreneurial ways, Miss May sold fish hooks to the local children. Almost without exception, those old enough to remember her at all remember buying them from her. As Amanda described in her first post on this site, this made the idea of calling the house “Fish Hooks” irresistible to us. An actual fish hook sold by Amanda’s great-grandmother, May Curry. Model ship builder Vertrum Lowe recently discovered the hook in its original wooden container among his treasures from the past, and has kindly donated them to the Albert Lowe Museum. But there is one detail of this story I have struggled to understand. Miss May’s former customers would often tell of using her tackle and their mothers’ sewing thread to go after bait fish in the harbour. And, occasionally pointing to the nails on their baby fingers, they would describe how small the hooks were. “Tiny shad hooks,” they would say. The thing is, I once had the privilege of casting for shad on Nova Scotia’s Shubenacadie River with Dennis Grant of the Atlantic Fly Fishing School. So the shad I know is a big brute of the herring family. Like the salmon, it goes upriver to spawn. And, like the salmon, it is a thrilling fighter. Five or six pounds of line-stripping rage. So, while kids jigging for shiners off the New Plymouth dock made perfect sense to me, the idea that fish hooks of pinkie-nail size were designed for shad was a contradiction I could not reconcile. At least, not until I saw this fascinating post about bonefish on the Rolling Harbour Abaco blog. And so the light bulb comes on. Unless otherwise noted, all photos by Randy Curry, Green Turtle Cay. Hard to believe it’s been so long, but seven years ago today, Tom and I were married on the beach at Green Turtle Cay’s Gillam Bay. You’d think that planning a destination wedding — especially on such a small island — would be stressful, but the truth is, it simplified the process. Once we boarded the plane, we just let go. There’s no Macy’s or Michael’s on the cay. No point fussing over anything we left behind. What we didn’t have, we would have to do without. Most of our wedding party stayed at Roberts’ Cottages, which were ideal for a large group. Three simple but spacious cottages, each with a large screened porch, right on the shore of Black Sound. There’s a dock for ferry pickups and drop offs, and though we were within easy walking distance of town, the large, tree-lined property felt incredibly private. As we hoped it would, Robert’s Cottages quickly became wedding central, with guests dropping by all week to visit and enjoy a cup of coffee or a Kalik. Though the weather on the Monday we arrived was beautiful, by Wednesday, we were experiencing near-monsoon conditions. Let’s just say the extra-large garbage bags I brought along served us well. They became waterproof containers for wedding decorations and party favours, and seat covers for golf carts. My Mom and cousin even used them to fashion some very stylish rain gear. Thursday brought a new group of arriving guests, Tom’s bachelor party at Miss Emily’s Blue Bee Bar and — thankfully! — glorious sunshine. We had invited guests to drop by our cottage for Friday evening cocktails to kick off the wedding weekend. It was a gorgeous, starry night and we went to bed relieved to have dodged a bad-weather bullet. Saturday morning, I got up early and opened the blinds. It was pouring. Not a little drizzle. Not a light shower. Heavy, dark clouds and fat, stinging raindrops. All the brave things I’d said during the week (“Don’t worry, we have a rain plan,” “We can’t control the weather,” “It’s not where we get married that’s important,” blah blah blah…) went out the window. I wanted to get married outside, on the beach, at Gillam Bay. After a good cry and a lot of comforting from Tom, I hopped in the golf cart and headed to Gillam Bay. I sat in the rain and made peace with the idea that after months of planning, and with so many friends and relatives making the journey to join us for a beach wedding, we’d be getting married indoors. As I drove back toward town, the rain seemed to ease a little. The clouds seemed brighter than before. By 11 a.m., small patches of blue began to appear. 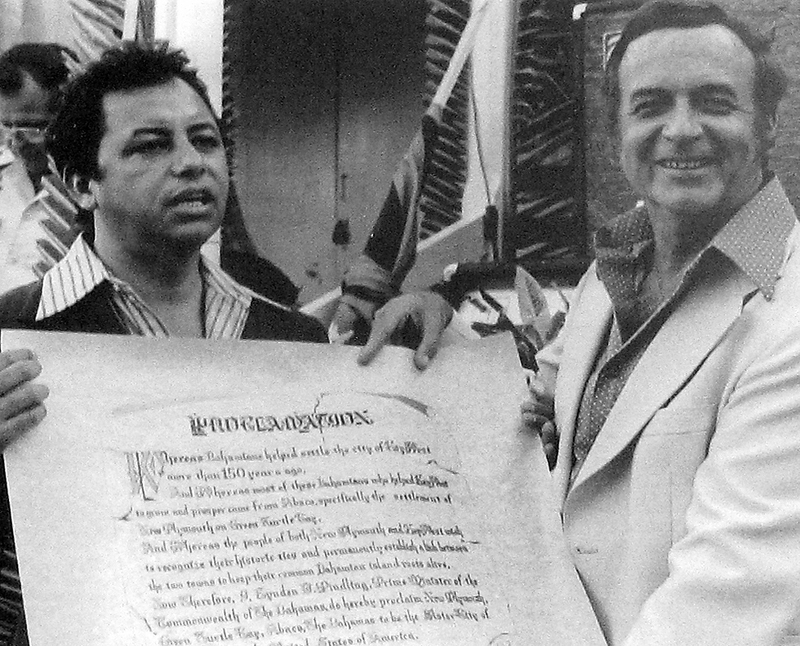 And by 1 p.m. – the deadline for pulling the plug on the outdoor ceremony – the sky was all but clear. Two-and-a-half hours later, escorted by our flower girl, Jade, my Dad and a Junkanoo parade, I walked up a sandy “aisle” to meet Tom. Our Gillam Bay wedding was low-key and laid back, just the way we wanted it. 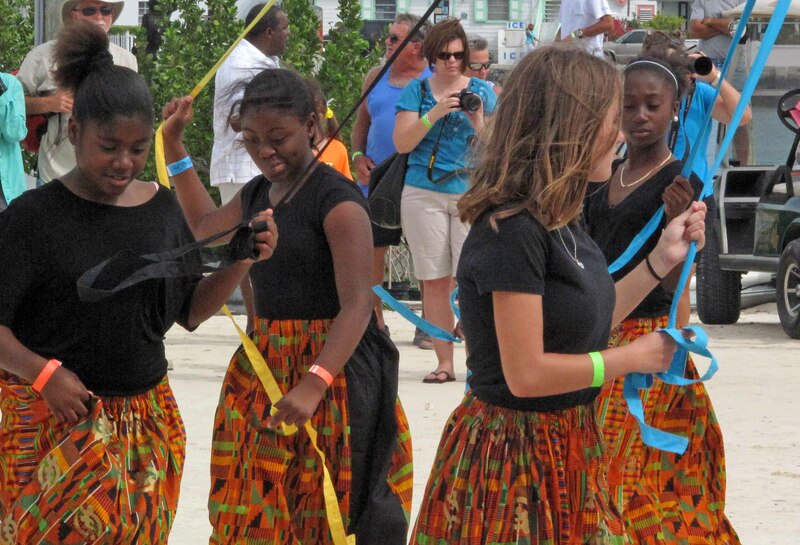 After the ceremony, the Junkanoo dancers and band performed for our guests, many of whom had never before seen this rhythmic and colourful Bahamian tradition. Before heading to Bluff House to join our guests, Tom and I took a little drive through town. It was nice to have a few minutes to ourselves to absorb all the day’s excitement and to enjoy New Plymouth on our special day. It was even more fun to do it in our wedding clothes, with all the town children waving to us and following the golf cart. Our reception was held in the Bluff House conservatory — which, sadly, has been damaged by hurricanes in recent years. But that night, it was beautifully decorated with huge, white paper lanterns and gauzy curtains billowing in the breeze. We enjoyed a Bahamian buffet of grilled lobster, ribs and chicken, peas ‘n’ rice, potato salad, johnny cake and more — all delicious. After dinner, toasts and cake cutting, we all danced outside, under the stars. A light rain began late in the evening, putting an earlier end to the reception than we’d planned, but given how fortunate we’d been earlier with the weather, we didn’t dare complain. Without a doubt, our favourite part of the wedding was having the opportunity to spend the entire week with family and friends from all over North America, and to introduce them to each other and to Green Turtle Cay. It wasn’t an easy or inexpensive trip to make, and we were grateful so many were able to join us. I’ll write a follow-up post soon about the nuts and bolts of getting married on Green Turtle Cay. In the meantime, happy seventh anniversary to my husband, Tom Walters. Thank you for giving me the wedding of my dreams and a wonderful life every day since. 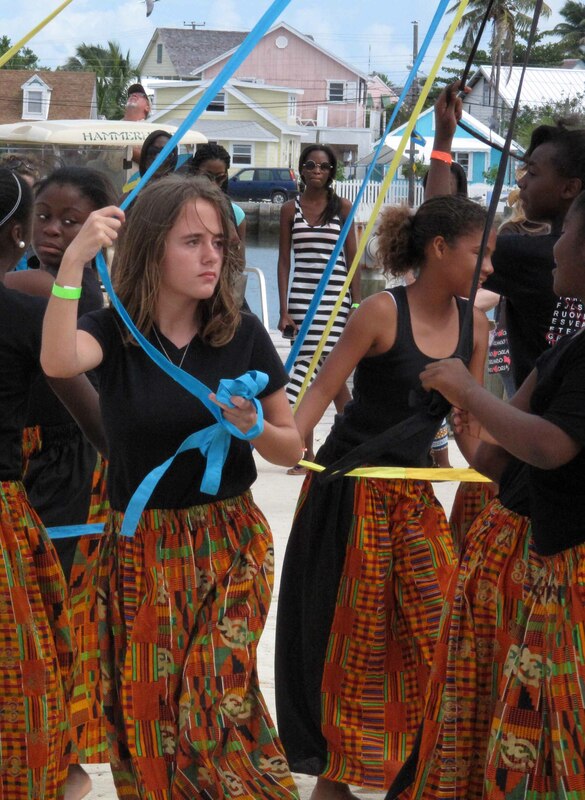 Of all the Bahamian artisans I met at this year’s Island Roots festival, one of my favourites was Rose McKenzie. Rose told me that, as young girls in Exuma, she and her sister, Neuiza Rolle, learned traditional straw work from their mother. The hats and baskets they produced provided vital funds for their family during difficult economic times. My grandmother, Lurey Curry Albury, told a similar tale. 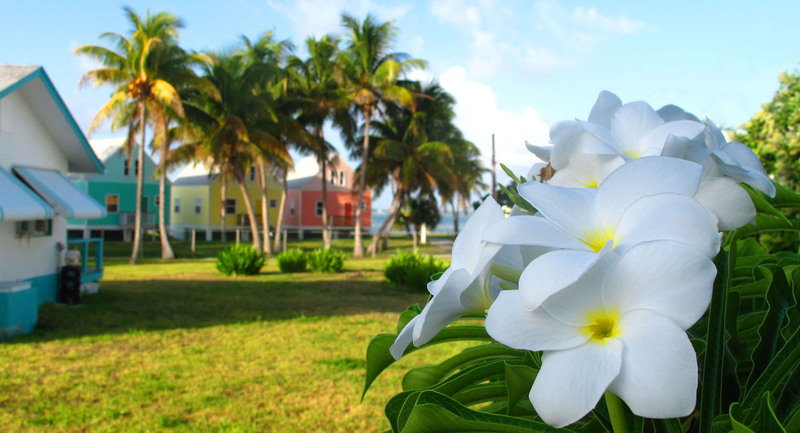 Early in the 20th century, Green Turtle Cay’s economy suffered several devastating blows. Its lucrative pineapple industry dried up when Cuba began exporting the fruit, and the U.S. annexed Hawaii, creating its own domestic supply. A burgeoning sponge industry was wiped out when disease killed off the local sponge beds. And in 1932, much of the settlement of New Plymouth was destroyed by a category 5 hurricane. Devastated and deep in poverty, the residents of Green Turtle Cay cobbled together livings as best they could. For my great-grandfather, Pa Herman, this meant fishing and small-scale farming. My great-grandmother, Ma May, sewed straw hats. Below, my grandmother describes how she harvested palm fronds and processed them to make plait – rolls of woven or braided straw from which hats and other handicrafts are created. “Mama would sew the straw hats, but I would make the plait. I used to go down to the Long Beach. There used to be coconut trees there. And there were plenty of thatch-top trees over at Black Sound. We used to get the young palm tops – cut them out of the head of the tree. We would cut those tops open and put them in the rock oven, let them get kind of crisp. If we didn’t have rain, we’d put them in the sea to bleach. Then, we would strip the palm tops with a needle or pin to make the strands to plait. Sometimes I’d mix white-top palm and coconut leaves together. Other times, I’d plait all coconut leaves, or make lace plait. Uncle Ludd would take the plait that I made and sell it up around the islands. He would bring me the money. We used to send bundles of palm tops to a lady on Guana Cay, and she would send some to another lady on Man-O-War. They would make plait, keep a little for themselves and send the rest back to us. Miss Leela, a Man-O-War woman, had a store down on Market Street in Nassau, where she sold dress material and different things. She used to sell the hats Mama made, but she didn’t send the money. She would send us material and other things we needed from the shop. 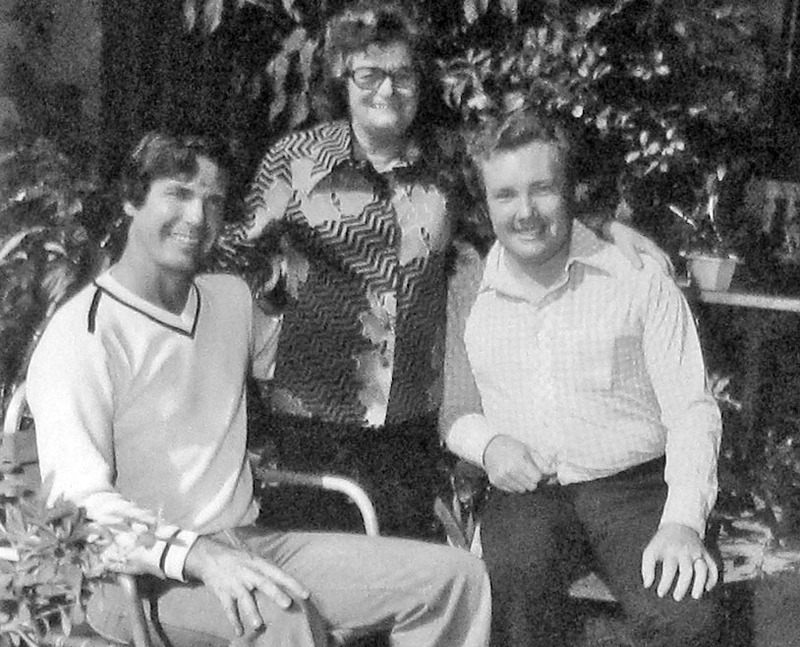 I remember when Sister Hughes and her husband came to Green Turtle Cay. Mama sewed Mrs. Hughes a hat. The plait was open and lacy, and I made roses out of crepe paper and put around the edge. Sister Hughes used to go to go to church in it. For many visitors to the Bahamas, straw bags and hats are little more than cheerful souvenirs. 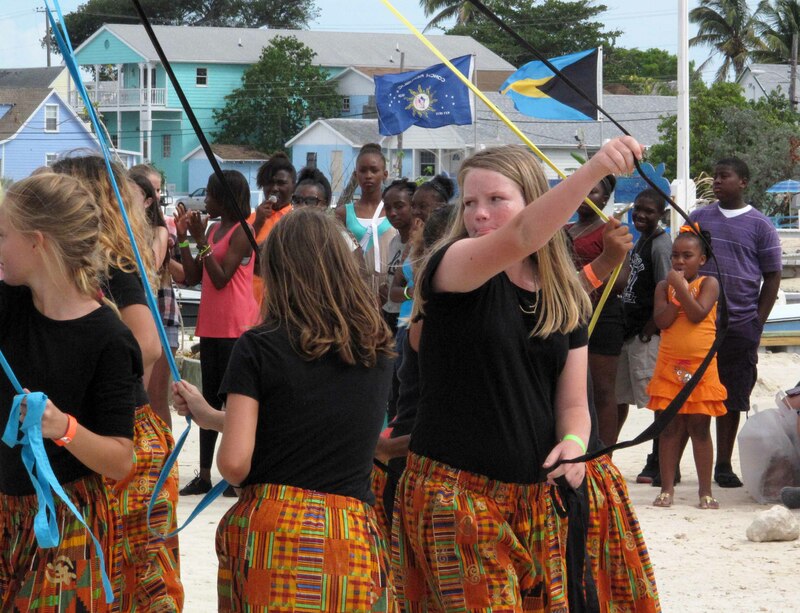 But for Rose, my grandmother and other Bahamians, this traditional handicraft generated much-needed income for their households during times of desperation and want. How things change when you go from being a tourist to being a homeowner! Though Tom and I are excited about everything that’s been accomplished at Fish Hooks over the past three weeks (there’ll be a post on that soon, I promise), we haven’t had much playtime. Which is a roundabout way of saying that we didn’t get to spend nearly as much time as we wanted at last weekend’s Island Roots Heritage Festival. I missed all the lectures I wanted to attend as well as most of the Royal Bahamas Police Band performance. 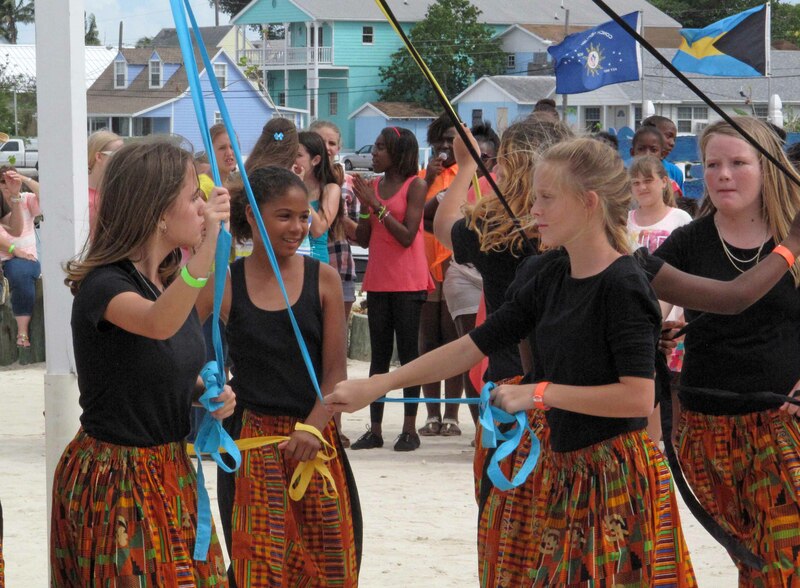 Fortunately, we managed to catch two of my festival favourites – the plaiting of the Maypole and the Junkanoo rush. Thanks to Tom for the video at the beginning of this post, showing the Green Turtle Slammers in action. There were fewer costumed Junkanoo performers than in previous years. The upside, though, is that it really allowed the Junkanoo musicians to shine. From the brass instruments to the drums, to the cowbells and whistles – it was a terrific and engaging performance. And the little musicians-in-the-making were adorable! I also enjoyed chatting with straw worker, Rose McKenzie. Like my grandmother, Rose and her sister, Neuiza Rolle, learned to prepare and plait straw from their mother when they were young girls in Exuma. 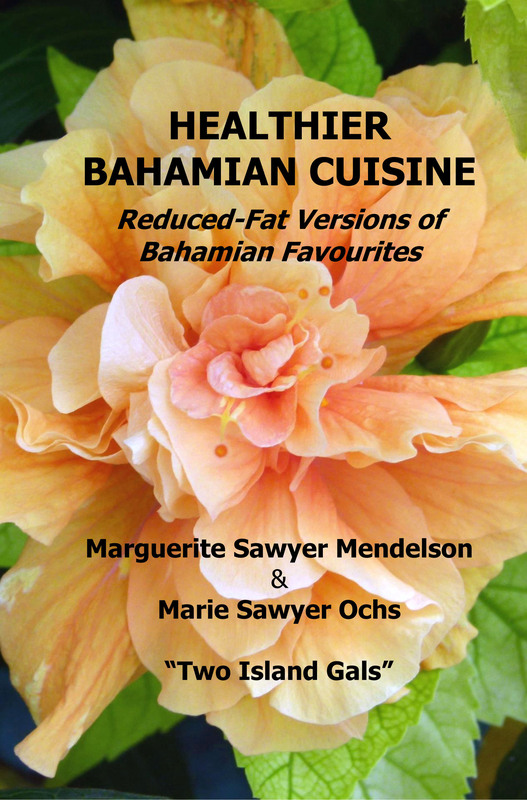 These days, the sisters live in Nassau, where they can be found selling their creations on Bay Street, near the Scotia Bank. 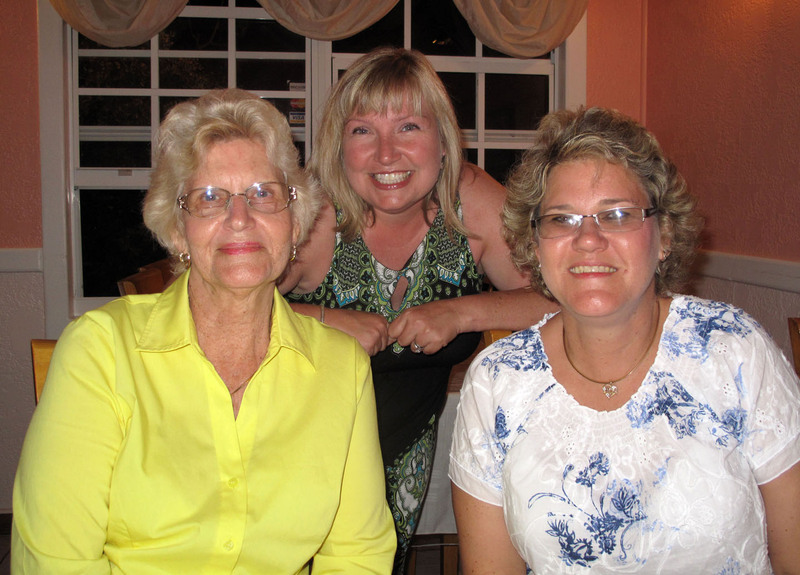 Though I didn’t get a chance to visit the Family Tree Research Center, I did learn a little more about my own island roots, as I got to know relatives I hadn’t met before from the Curry and Gates branches of my family tree. Congratulations to the Island Roots committee and a big thank you for all their hard work in putting this event together. I was so sorry not to be able to participate in more festival events. Next year, for sure! 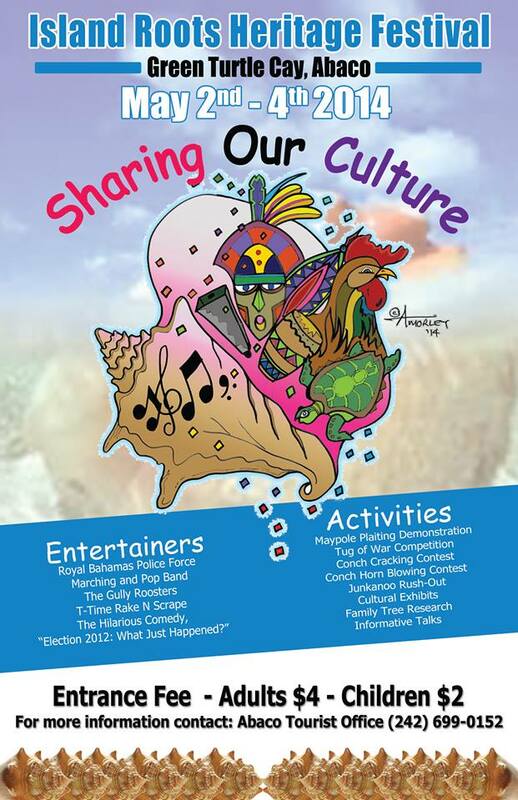 12:00 to 1:00 Kids’ Games – sack races, lime and spoon, etc. 12:00 to closing: The Family Tree Research Center in the Gospel Chapel Education Building will be open for everyone to inquire about their family roots. Peter Roberts, administrator of the Bahamas DNA Project and Philip Roberts will help research your family tree. Schedule appointments to ensure time with a researcher to discover your family history. Informational display boards will feature tributes to the settlements, towns and cays of Abaco, Abaco Parrots, caves and caverns, lighthouses, boat building, Blue Holes and much more. 9:00 a.m. to closing: The Family Tree Research Center in the Gospel Chapel Education Building will be open for everyone to inquire about their family roots. Peter Roberts, administrator of the Bahamas DNA Project and Philip Roberts will help research your family tree. Schedule appointments to ensure time with a researcher to discover your family history. 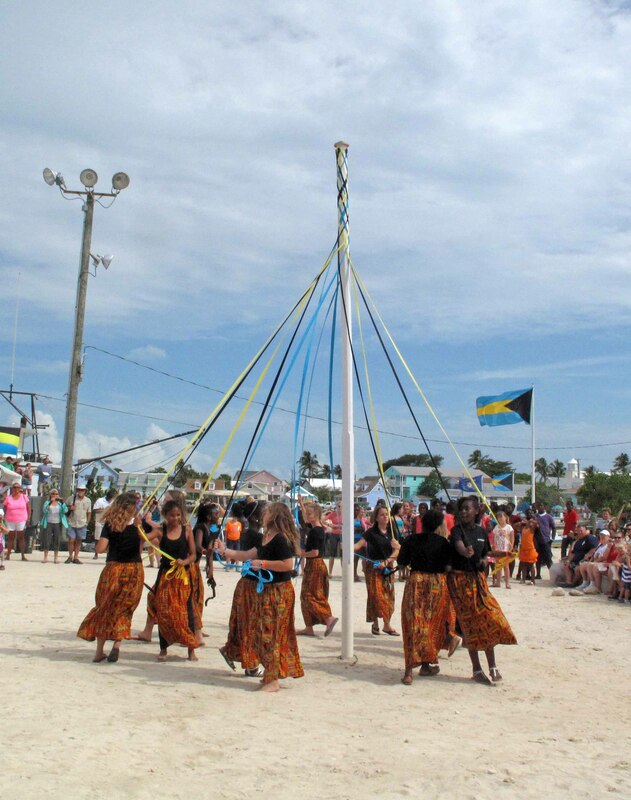 Please join us at the festival site stage to give thanks for yet another joyous time together, celebrating family and friends and sharing our rich Bahamian heritage with the world. 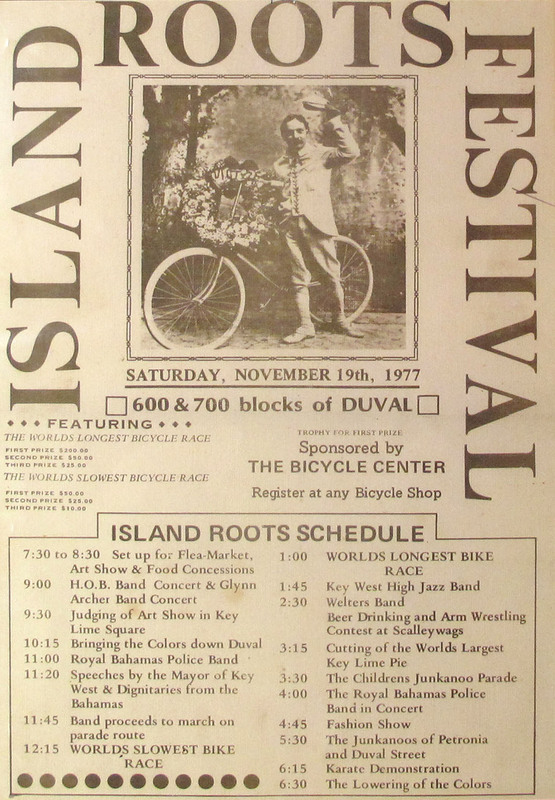 For more information, drop by the on-site information tent, or visit http://www.islandrootsheritagefestival.com. Perhaps I shouldn’t wonder, given the potcake’s gentle nature, but most of the two dozen or so dogs crated in the front yard of Marsh Harbour’s Island Veterinary Clinic seemed surprisingly calm. Many adult dogs watched the volunteers around them with apparent interest. 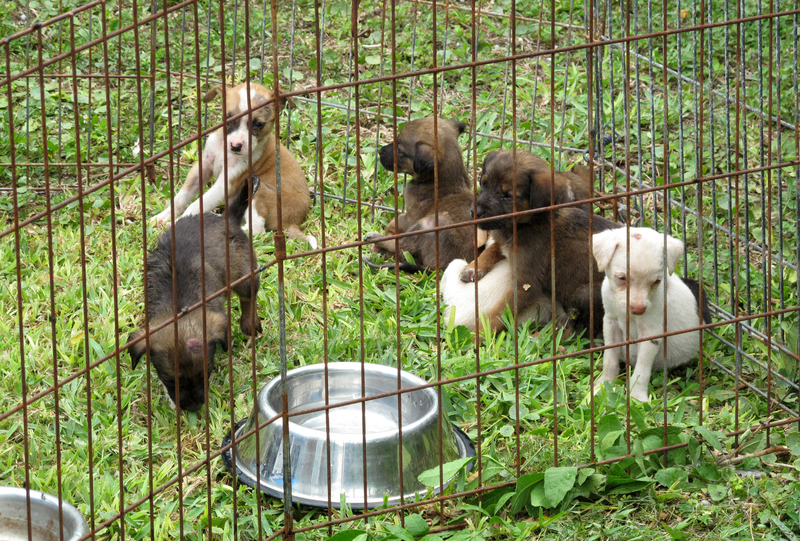 Six recently rescued five-week old pups napped in tangled piles, limbs splayed. A seventh slept, curled up in an empty food bowl. Some of these dogs (and cats) had been brought by their owners to the free spay/neuter clinic. 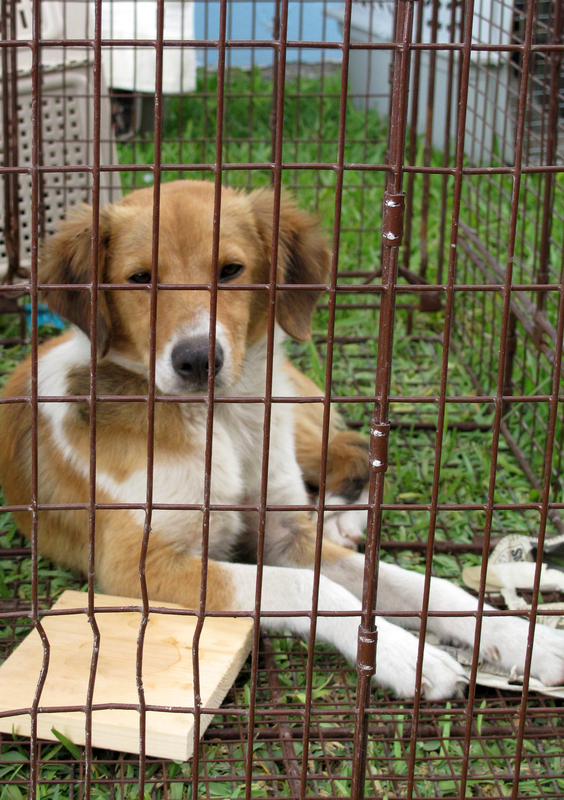 Volunteers had rounded up others from areas with large populations of strays. For many animals, it was likely their first time being crated — possibly even their first time at a vet’s office. But, peacefully and patiently, they waited. Inside the clinic, the mood was much more energetic. Twenty or so volunteers from a variety of rescue organizations including Royal Potcake Rescue USA, BAARK, the Abaco Shelter and the Hope Town Humane Society, and three veterinarians — Dr. Bailey from Marsh Harbour, Dr. Dorsett from Nassau and Dr. Wildgoose from Freeport — ran an impressive and efficient operation. 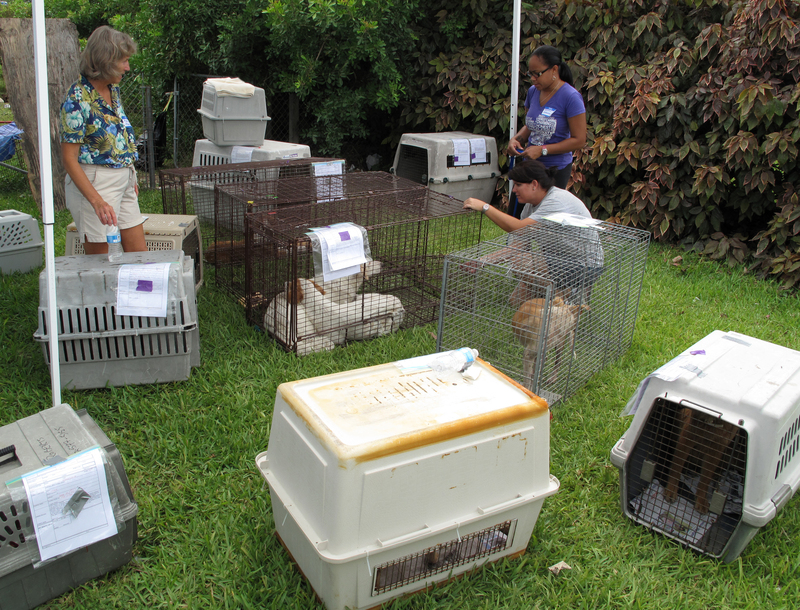 The dogs and cats on the front lawn were recent arrivals, each of whom had been assigned a number. Corresponding paperwork was completed and attached to each crate. One at a time, the animals were brought to a makeshift sedation area in the clinic’s front office. Once the anesthetic had taken effect, each was carried into one of three operating rooms. Post-surgery, potcakes and potcats were brought to the recovery area, where each was assigned a volunteer. Volunteers stayed with the animals, gave them TLC and ensured there were no complications as the sedation wore off. Once awake, the still-groggy animals snoozed in crates until their owners picked them up, or until they could be released back into their neighbourhoods. Homeless dogs – including that adorable litter of five-week-old pups — will be cared for until new homes can be found. 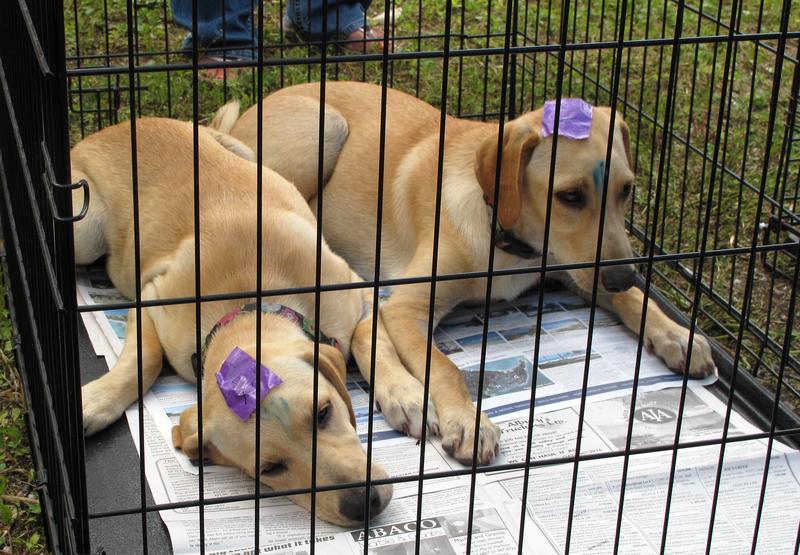 If you’d like to adopt a potcake, contact Royal Potcake Rescue or Abaco Shelter. Rescued by clinic volunteers, these puppies will be given medical attention and put up for adoption. 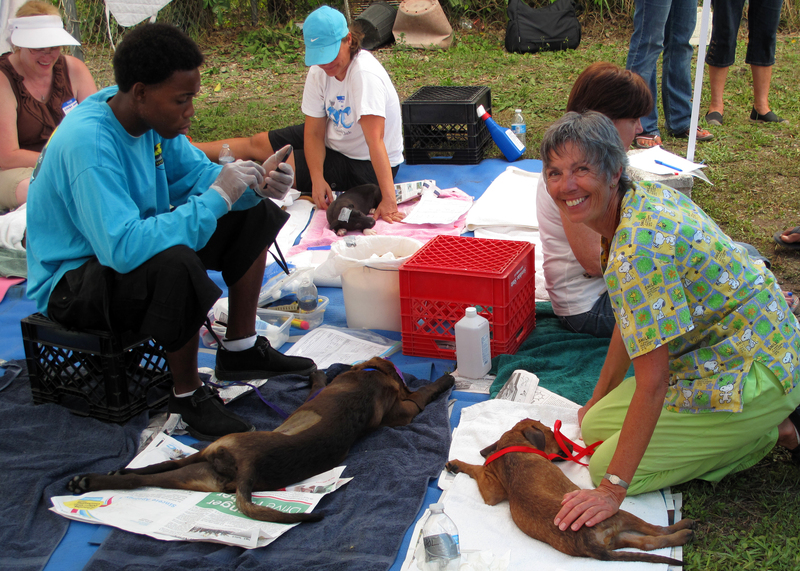 Eighty-two dogs and cats were spayed and neutered on Friday. 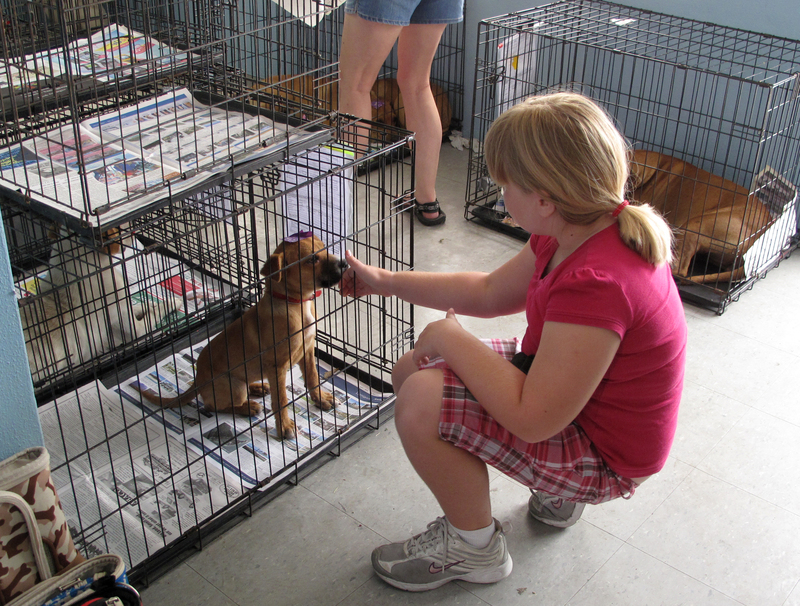 At that rate, the clinic will likely exceed its goal of 200 animals treated over the three-day event. The clinic continues until mid-day on Sunday, April 27. Less than two weeks until the next Island Roots festival! Hope to see you there. If you haven’t booked your flight yet, I hear Silver Air is having a last-minute seat sale. Tom and I are back on Green Turtle Cay, and excited to continue with our Fish Hooks restoration. We’ve got lots of projects planned for the next few weeks and will be posting updates as we go. We finally got to meet our new Green Turtle Cay neighbors, Drew and Penny Roberts, whose recently restored home, Salty Dog, is just around the corner from Fish Hooks. I posted last trip about how beautiful their island home looks now that it’s been restored. Judging from the photos below, which Drew recently sent to me, the interior is just as charming. For more information, or to rent Salty Dog, call (242) 365-4047. Now that we’re back on the cay, we’ve noticed the lights burning well into the night at Mo-Mo’s Suga’ Shack. Mo-Mo (aka Melissa Albury) reports that the bakery, which opened this past February, is doing well and keeping her busy. She’s recently added coconut bread and quiche to her menu, and established store hours as follows: Monday through Thursday: 7am – 9pm, Friday: 7am – 9:30pm, Saturday: 9am – 10pm, Sunday: Closed. My cousin Evan Lowe (grandson of Pa Herman’s sister, Aunt Bessie) recently sent me this image. Evan is 99% sure that the woman on the right is his grandmother, Bessie Caroline Curry Lowe (b. 1903, Green Turtle Cay), but he’d like to confirm this and identify the other people in the photo. 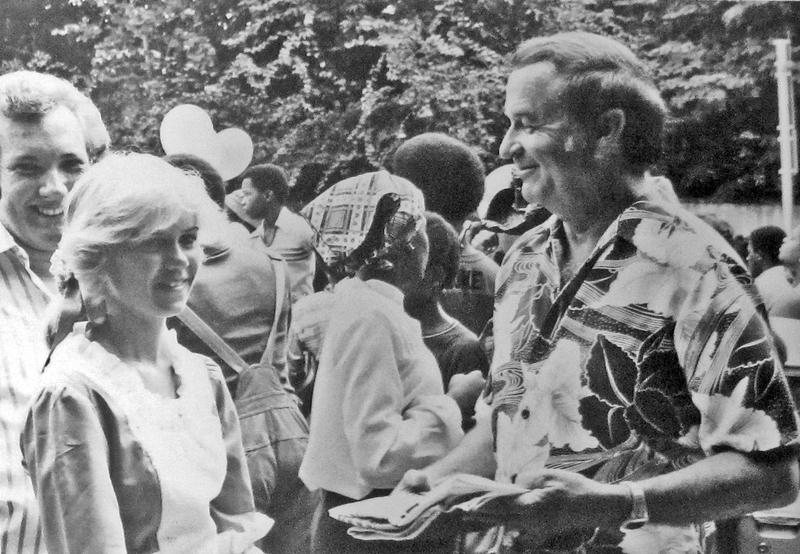 If you recognize any of these people and/or you recognize the setting where the picture was taken, please let me know. Thanks!